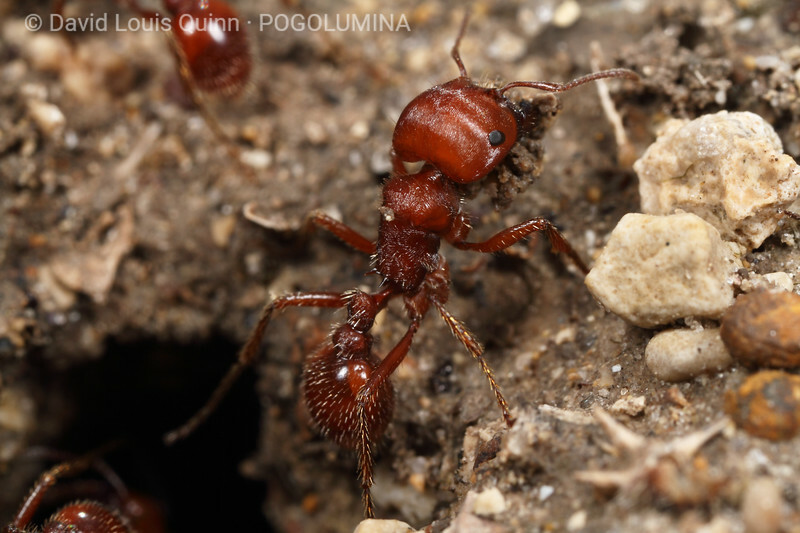 Images of Pogonomyrmex barbatus - the red harvester, at various locations in Texas and Arizona, USA. [IMAGE 4 of 4] Late winter/early spring nest maintenance. These Pogonomyrmex barbatus workers were slowly bringing loads of sand/soil up from the depths of their nest. They appeared to be utilizing their psammophores in some cases, and their mandibles alone, in others - depending on the moisture content of the soil they were transporting. It had rained the day before these images were captured, and much of the soil was quite moist and clumped - allowing it to be easily picked up and carried in the mandibles of these workers (like a clump of sticky rice can be picked up with chopsticks).